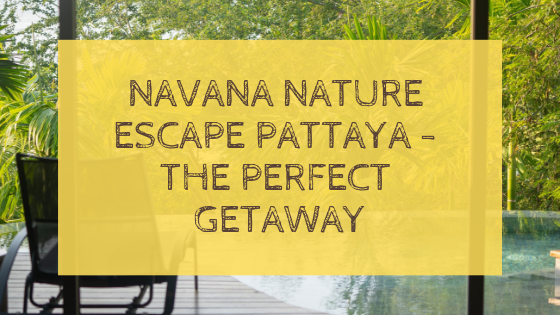 The beautiful and pristine resort of Navana Nature Escape is located in the beach town of Pattaya, Thailand, which is just a 3-hour bus ride from Bangkok. 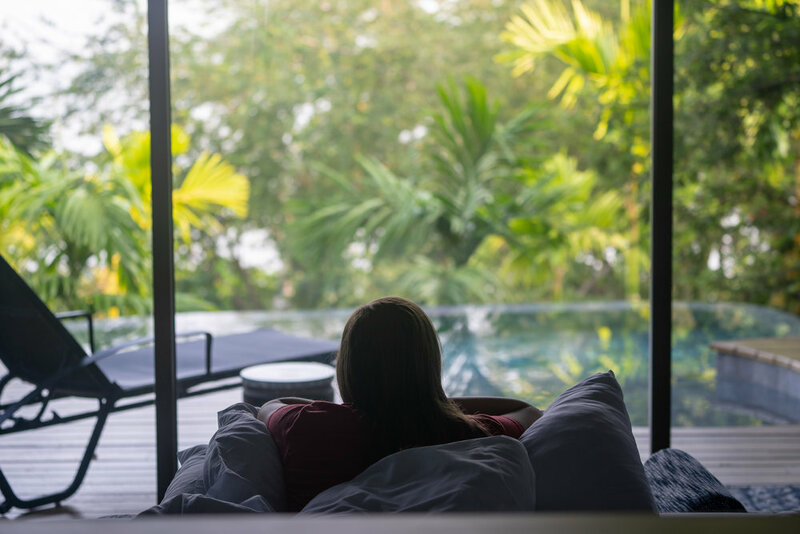 We were fortunate enough to stay two nights here while traveling through Thailand, but, unfortunately, we came away spoiled and now want to make this our home. Really, though, we had a wonderful time. Everything about Navana is geared towards helping visitors relax and enjoy their time in the area. This is not a downtown location (it’s in North Pattaya) so the area itself is a bit quieter and more peaceful than hotels close to Beach Road. It is also quite a bit smaller than your large, international chains (Marriott, Hilton, etc. ), but that doesn’t mean it’s lacking in character. Rather, with less people and smaller grounds you get a more charming and cozy atmosphere — or at least we did. Our room for two nights was the Sky Pool Villa. Honestly, I couldn’t think of a better name, so kudos to whoever came up with it because it’s very apt. Sky is appropriate because you’re located on the second floor. Pool because you have your own private pool attached to the room. Villa because it’s quite luxurious. The grounds and the main pool are really quite nice, but we found it difficult to venture outside the room since it was so relaxing (and we already had our own pool). However, there are a few reasons to leave the room, one of which is breakfast. A buffet breakfast is served from 7:00 AM - 11:00 AM. Here, you can enjoy a wide variety of dishes, including ribs, massaman curry, mango sticky rice, roti, bacon, toast, sausage, fresh fruits, and much more. There is also an egg station and a spot for dessert. I’m not used to having dinner-type dishes for breakfast, but I’m also not complaining. I don’t mind eating ribs for breakfast. Not one bit! Other reasons to leave the room include walks along the beach, the free sauna, getting a massage, sun-tanning, resting in a hammock, and I’m sure a lot more. But, once again, we didn’t leave very often, which I think may be part of the point of staying here. Overall, we loved it!